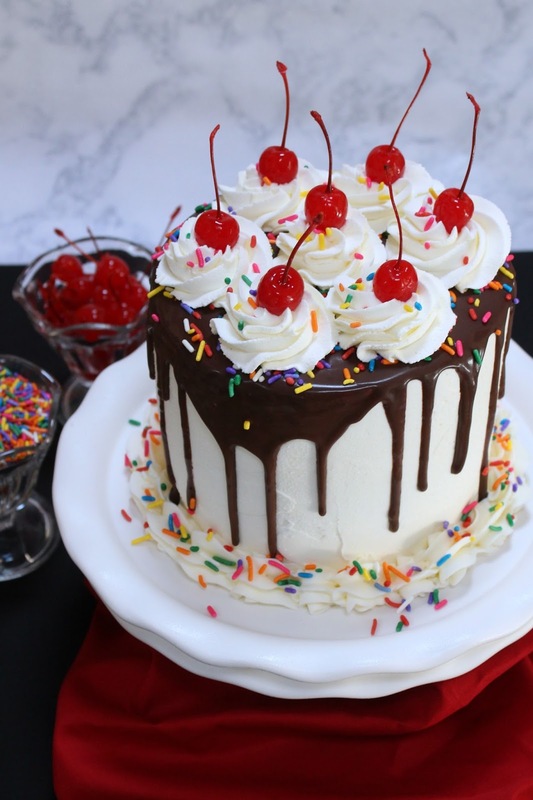 Banana Split Layer Cake is a sweet spin on the classic ice cream treat. 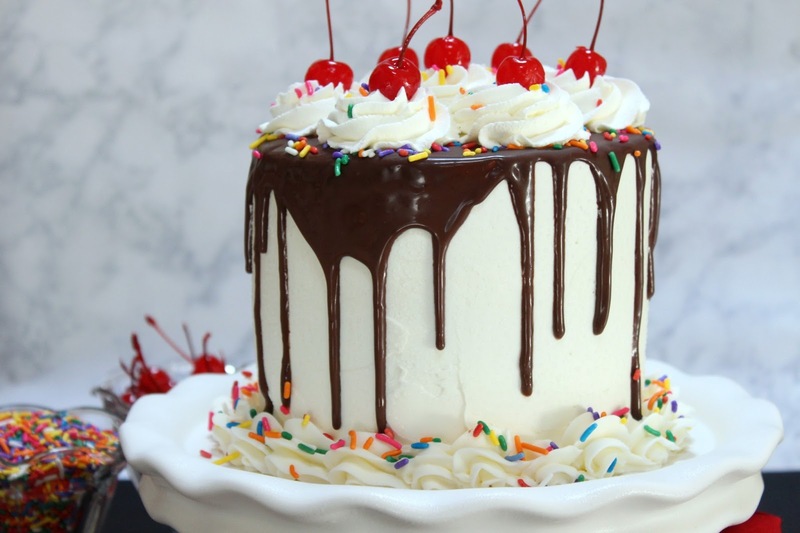 Banana Cake is layered with vanilla, caramel walnut and strawberry frostings, and then topped with a chocolate ganache drizzle, sprinkles, fresh whipped cream. Don’t forget the cherry on top! This cake was so much fun to make. I love creating recipes for Dixie Crystals and this one takes the cake, LOL. I have always been a fan of banana splits, so when given the task to transform a delicious sundae into cake form, I jumped at the challenge. The cake layers are a delicious banana cake. On sundaes, my mom always loves that sticky, gooey walnut topping, so I knew that had to become one of the filling layers. One of my favorite sundae toppings is strawberry sauce, so I made another filling layer into strawberry frosting. 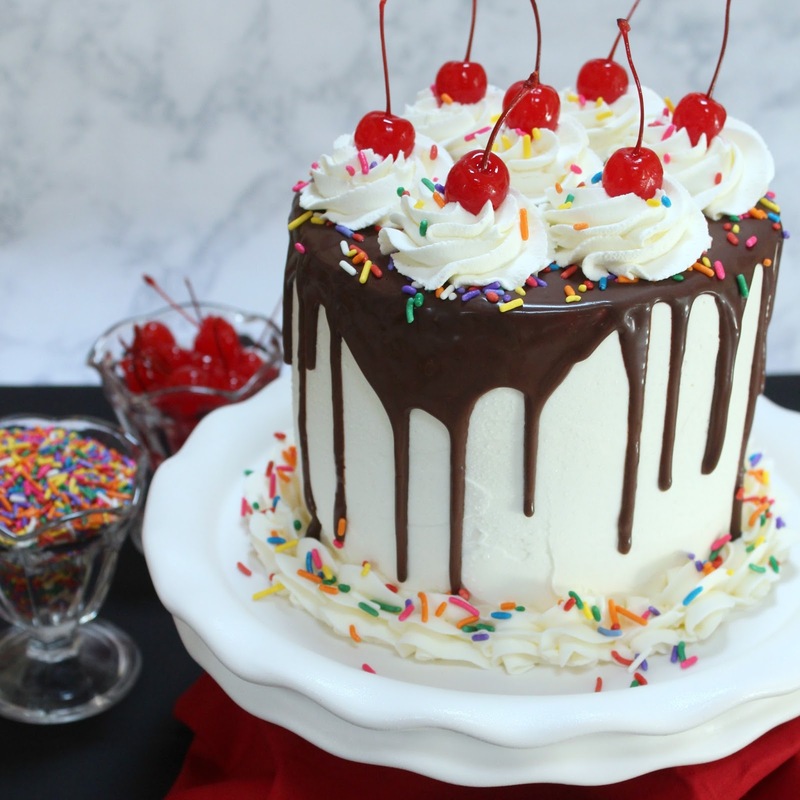 I have been obsessed with drip cakes lately. Google it if you don’t know what they are. These gorgeous cakes are all over Instagram and YouTube and the perfect look for my Banana Split Cake. I cannot wait to make more drip cakes and perfect my drippy technique in different flavors and colors. That drippy chocolate was then covered in sprinkles (you can’t have a sundae without sprinkles), piped with freshly made whipped cream, and of course, some cherries on top.